Christmas German Pyramid with Aframe Nativity has Mary and Joseph and Baby Jesus under the Manger sitting on a ledge that remains stationary and turning around them when the candles are lit and the carousel is spinning are the three wise men and the shepherd with his sheep. 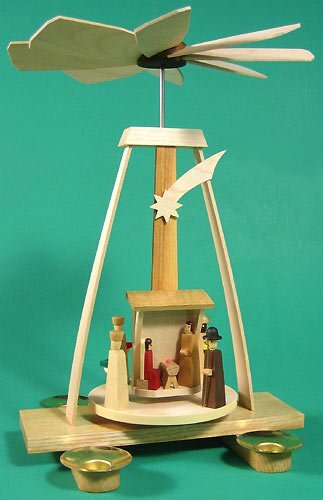 Christmas German Pyramid with Aframe Nativity is about 9 3/4 inches tall and uses 4 medium candles to turn the carousel. Made in the Erzgebirge Mountain village of Seiffen Germany. German Pyramids are collectible Holiday decorations for many Germany families. These wonderful handmade Carousels can be your familys collectibles too.